Okay, folks, for those of you who couldn't care less (yes, it's couldn't not could) about potty training, please move on to the next item in your Google Reader. But for the curious few out there (read: Grandmas), prepare to be amazed. I documented her "training" in this post...and I'm afraid she set the bar a bit too high. Seriously. It was like, 2 days of training and she was DONE. Trained. Fully trained both day and night. Zero accidents since. See what I mean? Set the bar too high. I'm scared thinking about what Chase has in store for us! Haha! So of course I figured karma would bite us in the bottom when it came time to get Chase using the potty. It couldn't be that easy the second time around. TWO accidental pees on his first day of training. 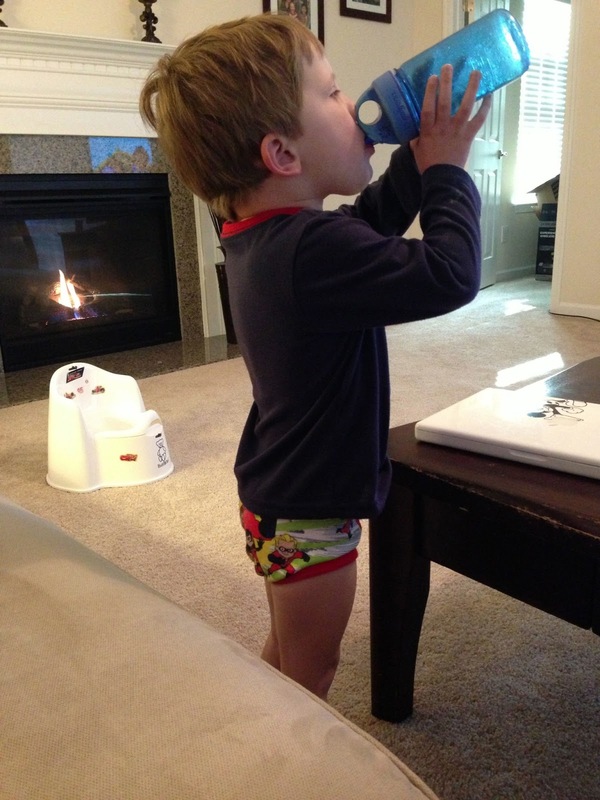 TWO pees on the potty with his big boy underwear not pulled down (obviously in a hurry) on day 2. ONE poop in his big boy underwear on day 2. ZERO accidents in the past 4 days. No peeing on couches, carpet, flooring, car seats, beds... NADA! DRY DIAPERS in the mornings. DRY PULL-UPS after nap times. 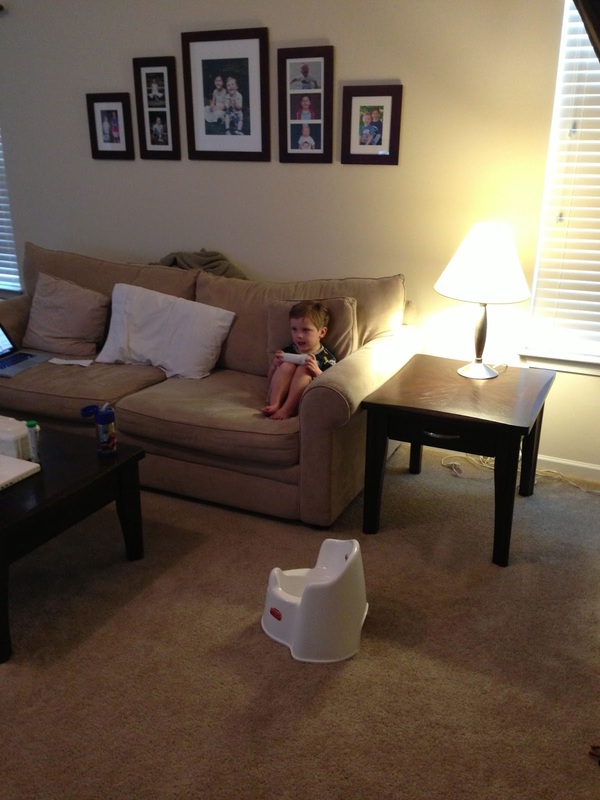 The kid will even fuss in his room after bedtime if he needs a trip to the potty. Last night hubs took Chase's little potty into his room when he was fussing and the boy pooped on the potty, went to sleep and, of course, woke up clean & dry. 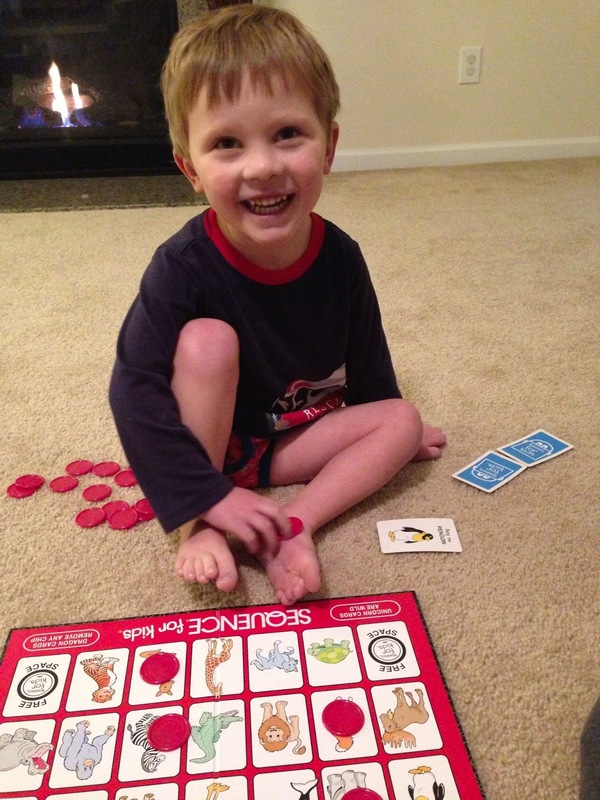 Tonight I put him to bed and after our story, prayers, hugs and kisses, he informed me he needed to go potty. I took him to the kids' bathroom and helped him sit on the actual "big" potty. He pooped. The end. It's seriously unbelievable, people. I had NO IDEA. Do you know how many potty training horror stories I've read? How many blogs about the drama and online forums about the frustrating and sometimes strange issues and problems parents face when it comes to potty training their kids?? I had NO idea. I am so shocked. And so blessed! I can't believe I'm not scrubbing poopy underwear 8 times a day and cleaning messes out of carpet left and right. Honestly, the most frustrating part of this process had to be yesterday (Monday). See, Sunday we had church and then I had to work all day. This means hubs was home with the kids and had the joy of handling the potty training after I spent the previous 3 days solely responsible for it. Apparently Chase only peed like twice the whole day and never pooped. Like, EVER. For the entire day. Seriously?! I was so worried about the explosion that would be in store for me on Monday while hubs was at work. Instead, the kid went on his potty about 30 (THIRTY!!!) times throughout the day on Monday. I'm not even joking or exaggerating here, either. He'd pee. We'd dump and flush the potty, wash hands, get M&M's, and go back to the task at hand (usually Super Mario Bros. Wii). Then about 2 minutes later he'd pee again and we'd repeat the entire process. Then not 10 minutes later, he'd sit and poop on the potty, and we'd repeat again. About 30 seconds after that, he'd sit and pee. This went on All. Day. Long. I got the point of wondering if the kid was manipulating the "free candy after potty trips" policy and was purposely holding things in to go more frequently to get more candy. I wouldn't put it past him. He's no dummy. So the worst part of this entire process was the fact that I had to get my lazy, tired, pregnant self up off the couch like 62 times yesterday to empty the potty chair and give out candy rewards. I'd say that's not too shabby, eh? And let me just add that today was the first day I ventured out of the house with him to run errands now that we've started the potty training. The boy went pee twice while we were at Panera meeting one of my BFFs for lunch and then went pee again while we were at Buy Buy Baby adding a few things to my baby registry. Then we picked up LO from school and he was still clean & dry when we got home. I continue to be amazed by this kid!!!!! Okay, enough potty talk. Here are a few pics of my little big boy from the past few days. This first one is hilarious!!! Our first two days of training was without any coverage on the lower half. 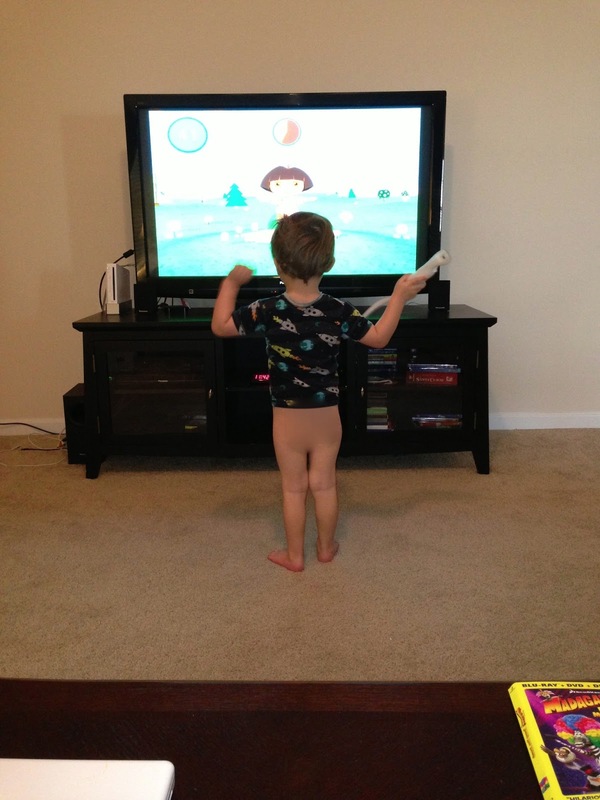 It certainly didn't keep this kid from his Wii games! LOL! Still with the Wii. I loved that he was all curled up on the couch with no bottoms on. Seriously the faith I had in this kid's potty training! I wasn't worried one bit about a pee'd on couch! By Day 3 we were able to start putting underwear on and taking it off during potty trips. He loves them! 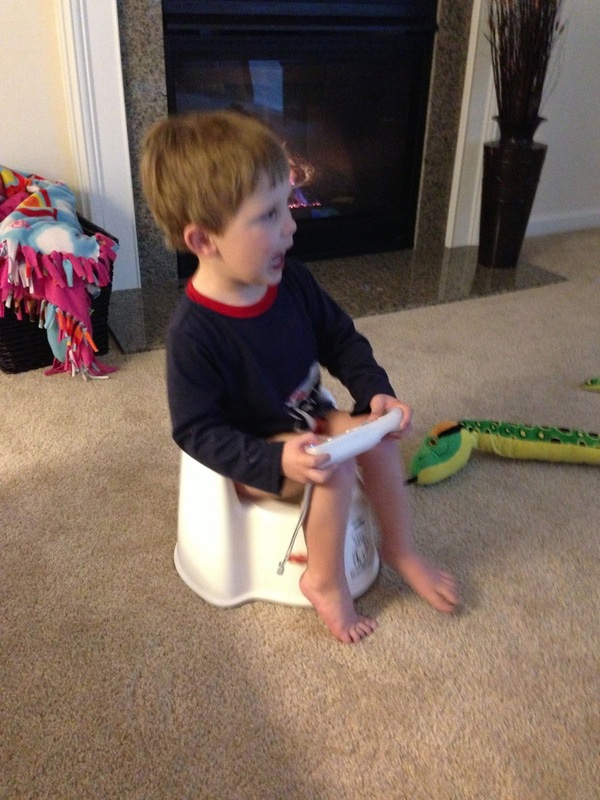 So he needed to go potty, yes, but he was in the middle of a very important task on Super Mario Bros. Wii and felt it necessary to multitask. Just love this kid!! Can't. Stop. Playing. Wii. Seriously, it's like a sickness for this kid. 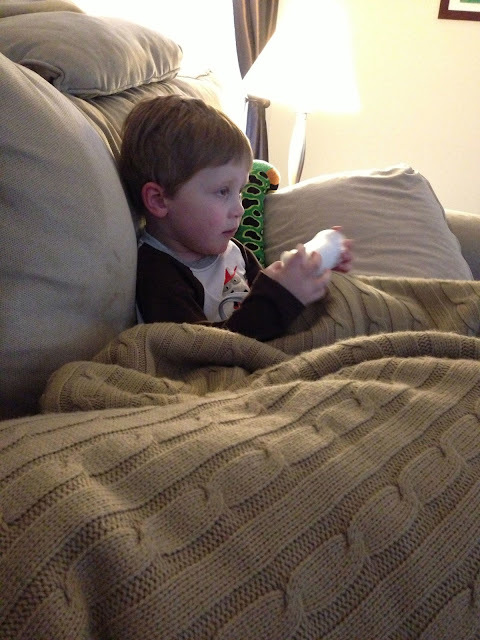 The first thing out of his mouth the past few mornings has been "I be Mario the red guy, you be the green one." Haha! In summary, WAY TO GO, CHASE!!! YOU ARE MY ROCK STAR!! !